My first approach to writing this article was to open with a scenario that litigation professionals could relate to with regard to scheduling last-minute depositions: the stress it can cause with the high chance of something not going right. But I didn’t want to insult anyone’s intelligence by pointing out something that we are all too familiar with: Litigation professionals know firsthand how deposition planning can be unpredictable due to multiple parties’ calendars needing to be aligned, along with picking a convenient location for everyone involved. It can get very cumbersome. The task of setting up depositions oneself, or even communicating the details to support staff, can be just a small fraction of the workload, so that when it becomes complicated and time consuming, it causes other areas of the workload to suffer. Because reporters who work for Atkinson-Baker give consistent feedback, we know they are appreciative of the work Atkinson-Baker provides them, and they are very grateful to be able to serve high-caliber attorneys such as our clients. I asked a few of the reporters who handle a lot of our last-minute depositions how they manage what could be stressful situations or avoid them altogether. What follows are three separate “inside scoops” from our reporters in the field who share their perspectives on how they work to completely satisfy the client, despite working in an unpredictable and ever-changing field. “I am a freelance court reporter who has been working with Atkinson-Baker for the past couple of years. “What I focus on when asked to take a last-minute job is the location, how soon I am expected to arrive at the job, the estimated length of the job, and the turnaround time. Any information that can be supplied ahead of time to the scheduler to pass along to me will help me be better prepared, and then we can get things started more quickly when I arrive. “Everyone at AB is extremely helpful, and when they contact me about upcoming jobs, they are very thorough. They supply me with all of the necessary information and communicate it efficiently and effectively. “In order to avoid any scurrying around, it always helps to stay calm and have a sense of lightheartedness, while still being serious. Everyone’s time: the attorneys’, the witnesses’, the scheduler’s, and the reporter’s is valuable, and everyone is doing their best to be accommodating. “I have been a licensed reporter for many years and have worked with many agencies. I have found Atkinson-Baker’s staff very professional and prompt in alerting me to emergency situations concerning jobs. “I am sensitive to the high stress involved in scheduling, so I take measures to help them the best I can. For example, if I get to a job that has been cancelled, I let Atkinson-Baker know right away, to alert them that I’m immediately available for any emergency jobs in or out of the area – flexibility is a must. “Because we work in such a deadline-driven profession, a reporter should never take on jobs that he or she cannot handle in a timely manner. Getting there early to set up and producing the most accurate and timely transcripts must be kept as the highest priority, so that we always exceed the clients’ expectations. “Court reporting is a very demanding and competitive field, and professionalism, promptness, and impeccable work ethics are a must. “I make sure that I arrive at least thirty minutes early for a job because it gives the clients a sense of relief and allows me plenty of time to set up and be ready. “Excellent rapport and communication with Atkinson-Baker staff is the key to keeping stress levels down. The customer service reps are excellent at arranging last-minute schedule changes and always are available for their reporters. “Last week I went out on a last-minute deposition that could have been a disaster. “The arbitration was a week away. The Petitioner was in pro per. The witness was the Petitioner’s designated expert who was designated five minutes after the depo started. Both the Petitioner and the witness were hostile to and distrustful of defense counsel, our client. “Throughout the deposition, the witness objected to questions and the Petitioner gave the witness answers; and in the end, the Petitioner and witness got up and walked out of the room while we were still on the record. But it wasn’t a disaster, for two reasons. “First, because I arrived early, our client was able to let me know that this might be a possibility. It may seem like a small thing, but I find it much easier to prepare for situations when I leave enough time on the front end. “Second, I switched my attitude from ‘I’m here to serve’ to ‘I’m here to help take charge if need be’ — a variation on the same theme. I told our client I didn’t mind stepping in and keeping order if necessary. Especially in cases of a pro per litigant, I find it helps diffuse the tension by demonstrating that I am there as an officer of the court. “In this particular instance, I was lucky. Our client kept his eye on what he wanted: to make a record. He didn’t get lured into fighting with the witness who wanted to win the case right then. His discipline made it easier for me to write well and, therefore, get the transcript out very quickly. “Arriving early with a positive attitude ready for anything is key to providing the best product, not to mention the fact that the production crew at Atkinson-Baker is top notch and gets the transcripts turned around quickly. These reporters’ commitment and dedication to go the extra mile reflect the overall work ethic of all the Atkinson-Baker court reporters. They are skilled at providing the best service and producing the best product in an environment riddled with last-minute change and uncertainty. 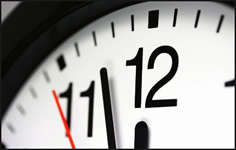 For many legal professionals, just hearing the words “last-minute deposition” can bring on feelings or thoughts of panic, stress, worry, chaos and confusion. But because of the high-level skill of reporters and their detailed, constant, and efficient communication with Atkinson-Baker’s scheduling staff, who are available 24/7 to cover last-minute emergency requests for reporters, coming in from all over the country, clients don’t have to feel uneasy. In essence, a big peace of mind.